I AM IN!!! IT IS ON!!! 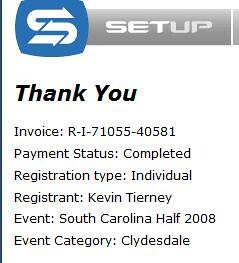 So what better way to keep my commitment to do the SC 1/2 (since I am already training for it) then to go ahead and sign up. So I signed up tonight. I am stoked. The best part is it looks like I will be doing this race with several of my blogging peeps in addition to lots of folks from BT and the local tri club. I am stoked. So tonight was an uneventful swim. No aquarobics tonight!!!! Happy training for the half...I look forward to reading about it! OMG you must be so excited/thrilled/nervous??? Congratulations on making that committment! Now I can follow your training for your first 1/2 prior to mine. Uh huh. ROCK ON! Way to take the plunge! You know what's next right? Do I dare say IM? Get some rest for that early wake up call. NICE JOB! You are well on your way! I just put hte aquarack on my bike too. Very convenient. How exciting that you singed up for the half!! Yeah! That'll be a great race. Cool, I'll see ya at the Half. Are you a BTer? If so, what's your screen name? isn't it great to enter it??? Good luck. Now you have a specific goal to train for-you nervous yet??? Bring it on! Now, you are one step closer to your goal. You have the motivation and desire to conquer this Half IM. David and I will be there too, Kevin. He'll be doing the half as well! Fun time! Looking forward to meeting you.